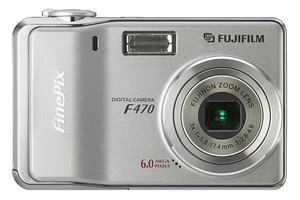 Fujifilm FinePix F470 digital camera is the successor to Fijifilm FinePix F460. F470 is a pocket-size, slim-line and stylish 6.0 megapixel digital camera featuring 3x optical zoom lens, 2.5-inch LCD monitor, 16 megabytes internal memory, 10 selectable scene modes, manual mode, VGA movie capture of 30 frames per second with sound, Live video on the LCD monitor with 60 frames per second, mode dial that allows selection of any of three modes (Auto/SP/Movie) with a single touch and is just a mere 19.7mm thick. More features, specifications and sample images can be found at F470 official homepage (no longer available). DigitalCameraInfo (dead link) has a first impression reviews on Fujifilm FinePix F470 and concludes that F470 has its pros and cons. The camera provides a 3x optical zoom lens with a wide f/2.8 aperture. The camera is mostly automatic with its 10 scene modes, an auto mode, and a manual mode that acts more like a Program mode. It has a decent burst mode and starts up in less than two seconds. It is extremely portable and includes 16 MB of internal memory. However, despite the presence of the auto mode, the auto focus system is difficult to maneuver and will potentially drive consumers crazy. Sometimes it focuses, sometimes it doesn’t – and because there’s no telling what it will do, this could be a deal breaker for many consumers. DigitalCameraReview reviews F470 and concludes that like Fuji’s legendary Finepix 2600, the stylish little F470 is a very basic digital camera and an excellent choice for first time digital camera buyers who want a reasonably priced, genuinely uncomplicated, solidly built, and ultra-compact digital camera. The eminently pocketable little F470 performs like a champ in all outdoor settings, making it a natural choice for casual photographers, snap-shooters, and weight/space conscious backpackers, mountain bikers, and rucksack travelers. Chromatic aberration (purple fringing) and noise are a bit higher than average, macro/close-up and dim/low light performance leave something to be desired, and battery life is just decent, but the Spartan little F470 is a super picture taker. Steve’s DigiCams concludes that with a 6-megapixel imager, good image quality and uncomplicated automatic and scene modes, the Fuji F470 meets the photographic needs of the beginner in a stylish and lightweight package. While it has no optical viewfinder, its LCD is well implemented, especially in conditions of low ambient lighting. With a street price of less than $250, it’s a good value for those looking for a pocketable digicam that covers all the basics with style.